Yes, I am a bleeding heart liberal. But this is the dicentra spectabilis in my backyard. Gorgeous! I haven't seen these in years. Check out my WW too! I have one out front that I got as a division from my then-girlfriend when I moved in 9 years ago. It's so flashy and it just keeps getting bigger and bigger--I used to find it a little embarrassing to have such a plant so prominently placed in the most prominent part of my garden. But this year I'm finally getting into it. This IS beautiful. Thank you for sharing. I love the colors! Oh, the caption was classic. Both things to be thankful for! it's really beautifully frame. i haven't seen this one for a long time.Happy WW. How beautiful! 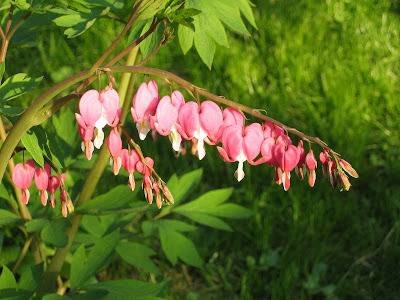 I love the bleeding heart flowers. Great picture too, by the way. So, I’m stopping by and let you know that I’ve got a list of several free books up for grabs in my May Pay It Forward Book Exchange. Come on over if you’re interested in entering to win or even hosting your own PIF giveaway this month! Here here !!! Much banging of the table. Liberal minds are hard to find! And the flower's nice too! I love bleeding heart liberals. And that pretty flowering plant too. Hey, I've got one of those too! And I too have a bleeding heart. My mom has those in her backyard. I'm so excited, I get to see her in two weeks!! I love the "old fashioned" bleeding heart. I had a huge one of these at the house we moved from, and I was sure I saw one coming up here, but there are NO perennials AT ALL. Perhaps tomorrow, when I am all on my own, I'll go buy one.